Today's episode of Behind the Blend may feel a bit out of season, but it's a particularly chill and blustery April morning and I've been thinking a lot about death and seasonal shifts lately. So, for today's foray into synesthetic perception, I would like to introduce you to an old Friday Afternoon fave: Raise the Dead. As you probably know, I perceive the world with my taste buds. My dominant form of synesthesia is Lexical-Gustatory. This means I literally taste words, ideas, feelings, personalities, etc. 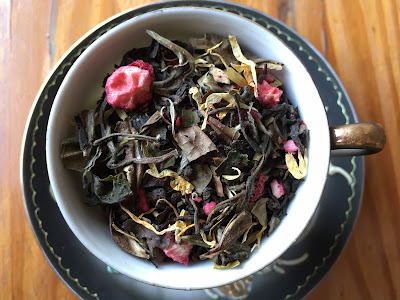 The overwhelming majority of my blends are direct translations to leaf of the flavors my brain-mouth is experiencing. Today, I wanted to share with you the way I experience one particular flavor profile: Love. I am frequently asked how I get ideas for my blends. Where does my inspiration come from? Which comes first, the blend or its name?